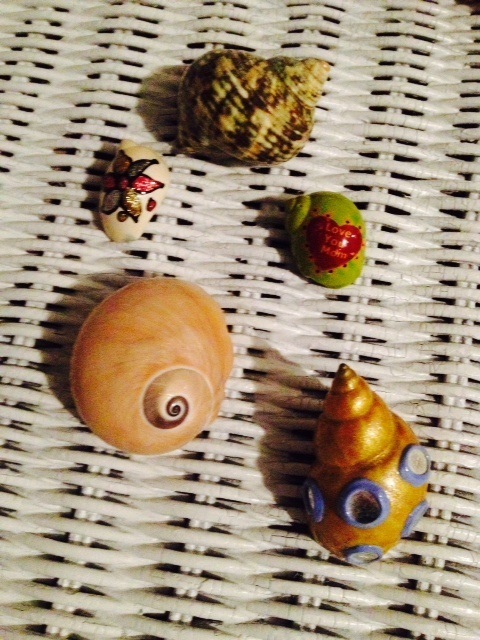 Hermit Crabs are fun to watch and children are fascinated by them! Find out what is involved in having one as a classroom pet. They are actually crustaceans. This means from the Crustacea class such as shrimp and lobster. There are literally hundreds of different species! Hermit is an ironic name for these land crabs. 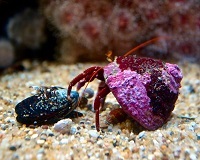 Hermit means one that lives in isolation but hermit crabs are actually social and live in large groups! It is best to have 2 or more of them as pets for this reason. This crab is a decapod: it has 10 legs. The left leg has a large pincer called a chela. It is used for climbing and to defend itself. Many times the chela will be a purple shade. They are not born with, nor do they grow, their own shells. When born, the search for a discarded snail shell. They do grow and will outgrow their shells so you will need to be sure to have extra shells in larger sizes for your crab to grow into. Also, they molt! They shed their skin once or twice a year. If your crab seems to be less active and not coming out of its shell much, this might be why. What kind of home does it need? It needs enough room to move around and explore. Also, they are social so it is best to have 2 or more. It needs a substrate to live in. Sand is typically the best choice. You can also use some aquarium gravel. Crabs will bury themselves in sand to cool off. They like moist. You can mist them with a spray bottle mist a couple of times a week (NOTE: They tend to become more active when you do this!). You can also pour a little bit of water in the corners of the aquarium. This will be absorbed by the bottom layer of sand. When the crab then wants to cool off, the bottom will be a little damp. The aquarium should be cleaned once a month and the sand changed. If you use gravel, rinse the gravel (NO SOAP) in clear water and let dry. Sand should be replaced, not reused. Check the cage every couple of day for discarded food or droppings and remove to avoid bacteria from growing in the cage. What does a hermit crab eat? Feed the crabs as often as they will eat. But, be sure to change their food before it spoils. They do need water. Keep their water dish full. What are a hermit crab's sleeping habits? Hermit crabs are typically nocturnal, but will play during the day. These are fun creatures to watch! They LOVE to climb! Having rocks, sticks, small terra cotta pots, etc. are great for them. They like to climb these things and will climb and then hang upside down from the cover of their aquarium. Be sure you keep a vented cover on your aquarium or they will climb out! What do you need for your hermit crab? A plastic one will work, but depending on your environment, it can get very hot inside. I have used a glass 10 gallon fish tank. Choose shallow dishes. If they are too deep, the crab can actually drown if it can not get out. Also, avoid dishes that are slippery on the bottom or your crab will not be able to get to the water or food. This can be found at pet supply stores. Choose shells that have openings larger than the openings of the shell opening it is currently living in. Have several for the crab to choose from. When picking up a hermit crab, be certain to pick it up from the middle or back end of the shell, not the front. This will scare the crab. When holding the crab, be sure the holder has an outstretched hand. Remember, the crab uses its claw to climb....if it feels it is falling, it may pinch you and, though small, it can hurt! The crab can also walk on the floor. I have always provided a large clean towel for the crab to walk on rather than the carpet. This ensures that your crab is not picking up any residue from paint, glue or carpet/floor cleaners that may be there. Prior to holding the hermit crab, I recommend having the children wash their hands in case there is any food the hermit crab may want to try to eat or glue or dirt on their hands. The average temperature that they like is around 75-80 degrees F. 90 degrees F or higher is too hot for them. Conversely, low temperatures can make them go dormant and possible die. Avoid temperatures below 60 degrees F.
Avoid having your crabs near the heater or the air conditioning. Do not "bathe" or submerge your crabs-they can drown. They are land crabs. You can, however, rinse them lightly once a week to help prevent food residue from getting stuck under their shells as well as to keep their gills wet, though it is not necessary. We actually did rinse ours once a month and then let them walk around on a slightly damp towel in our sand table. We did this when we cleaned the aquarium each month. We called it their Monthly Beach Time! Below are some resources you might find helpful with links to Amazon. We purchased our extra shells at the local mall. The companies and items below are ones that I have found to have very good reviews. Click Here to read my article which you may find helpful if dealing with this with your preschoolers. It also includes a list of books that might help. Go to Classroom Pets MAIN page for more ideas on classroom pet ideas!